We arrived at the PPLH Seloliman Reserve, which is built on the slopes of a volcano, not far from the village. It wasn't yet late when we arrived, so we were invited to meet the owner of the reserve, and have drinks and fried banana. He explained that he started the reserve over 20 years ago, to educate people about nature, plants, herbs, and the like. 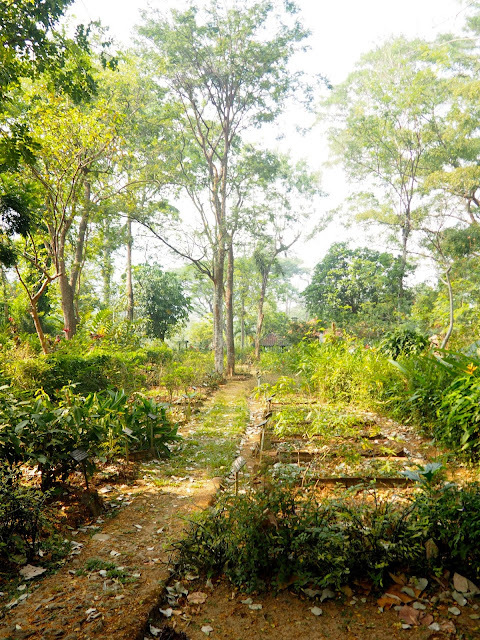 The reserve has various buildings, including the bungalows we were staying in, dorm rooms for student groups who visit, and the restaurant area, and each building was constructed by donations either from different organisations worldwide, or from individual contributions. Our accommodation was simple, though our bungalows had beds with mosquito nets, storage space, and our own little porch areas. The most unique feature was the bathroom, which was an outdoor area at the back of each bungalow, accessed by another door inside, but it was still a fully equipped bathroom, with running water and a flushing toilet - no squats! We were definitely getting up close and personal with the wildlife though, especially when my roommate and I discovered a frog in our room, which wouldn't normally bother me much until it jumped towards my face! We asked a staff member to help us get it out though, and didn't have any more run-ins after that. Our meals were included here, and we had a buffet of dishes to choose from for our dinner together in the restaurant, before turning in for the night. 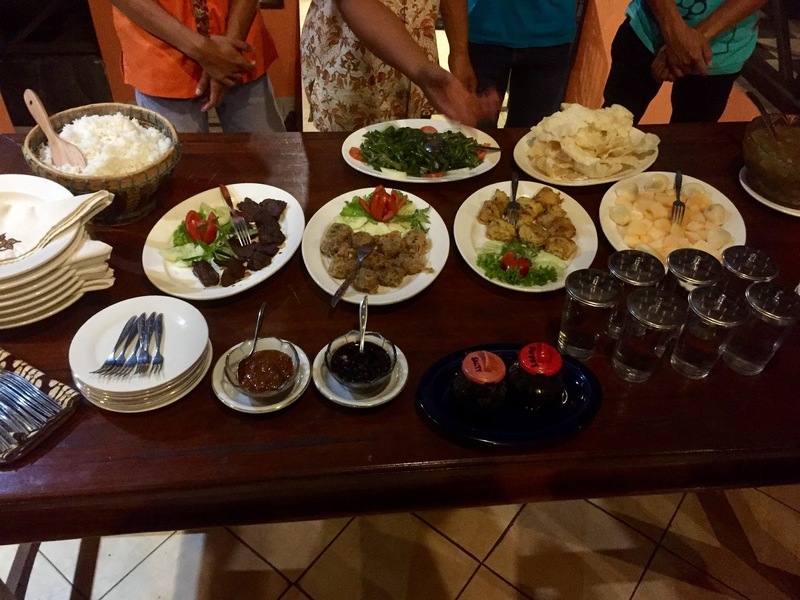 The next morning we had a similar buffet breakfast to greet us, before we embarked on our tour of the reserve and the village. The reserve is, of course, very environmentally friendly, with fish reared in the ponds, and vegetables grown on site. First, the owner showed us some of the trees in the middle of the reserve, which were planted when it was first being built. He explained that there were no trees in the area when they started, and they've all been planted and grown in the last twenty years. We walked through the herb garden, which contains dozens of different plants, and he explained some of their medicinal uses, then continued on to the vegetable garden, which seemed to overflowing with greenery. 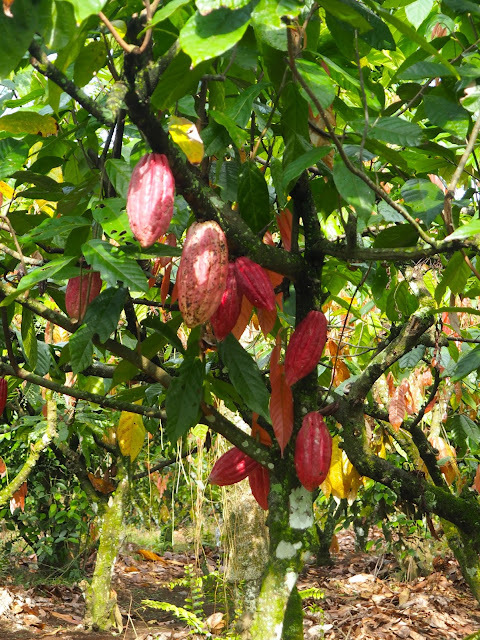 Around other parts of the reserve were trees and plants growing other fruits and flowers for consumption or medicinal uses. Our walk continued down to the nearby village, where we passed streets of simple houses, often with chickens or fruit trees or something else similar in their front yards. We also passed a small building where two nurses were sitting outside, with a few mothers and children; the reserve owner explained that the nurses come to give free check-ups and vaccinations to the children every so often, and will visit many other villages too. We came across a few other children along our way, who were happy to come out their houses to see us and pose for photographs, though they spoke no English. We also visited the home of an elderly lady, 96 years old, who was grinding coffee beans with a huge wooden stick. She sells the coffee every morning to the local villagers, before they go off to farm the rice fields; of course, we got to try some Javanese coffee too. Finally, we continued down to see the rice terraces for ourselves. There is a house being constructed on the hill overlooking them, and we were allowed to enter the empty building to get the best views from it - when it's eventually finished, this will no longer be an option for visitors! This was the quintessential rice terrace scenery you always see in pictures from Indonesia, with the fields stacked up the hillside and flooded with water. 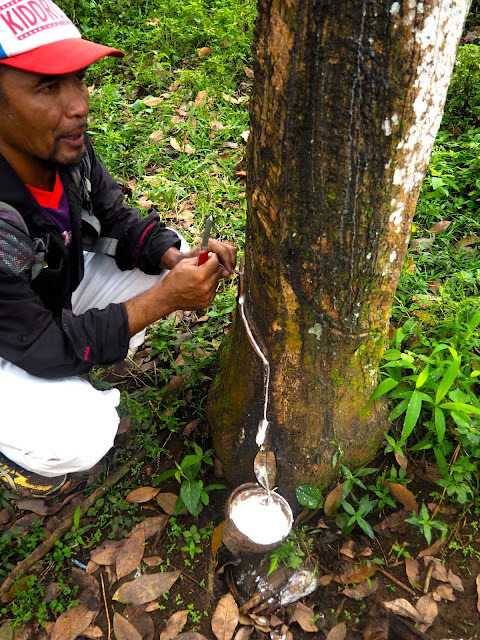 We then returned the way we came, to have lunch back at the reserve, and then to sample a herbal tea that the owner brewed for us, containing ingredients grown in the reserve, including cinnamon, cloves, cardamon, ginger, and lemongrass. Most interesting was the addition of the sapan wood, which has no flavour itself, but turns the tea bright pink in colour. Our driver picked us up and we drove through the afternoon, climbing higher and higher into the mountains to reach our accommodation for the next night - we could tell we'd gained a few metres in altitude when we got out the bus, and were greeted by much cooler temperatures! We all tried to head to bed early that night, as we weren't going to get much sleep again before we had to wake up in order to see the sunrise by Mt Bromo. We left the hotel at 3am, and hopped into the waiting jeeps, which drove us through the darkness, up winding mountain paths to reach the sunrise point. Although it was dark, we could see that the road had steep drops to the sides at points, and we also drove across a wide stretch of ash, while around us we could see red lava glowing in the dark, as it poured from the neighbouring volcanos. The jeep was too bumpy to photograph the lava, but it was definitely a spectacular sight to remember. When we reached the sunrise point, we were early enough to get a good spot by the fence, where no one would stand in front of us, but our earliness meant we also had more than an hour to wait until the sun rose - my roommate and I spent most of that huddled together on the ground, underneath several scarves, trying to keep warm in the biting cold wind. Eventually, the sky began to lighten and we stood up to watch the volcanos (there's more that just Mt Bromo there!) emerge from the dark, as the sky was painted in an array of colours, the sun rising to our left. Mostly it was reds and oranges, rising up to blue, but I did get this one shot of pinks and purples, which only lasted for a few moments. Once we were satisfied that we'd seen the sun rise high enough, we had to hack our way through the crowd that had gathered behind us to get down from the hilltop again. We stopped for some coffee and fried banana as a morning pick-me-up, then our jeeps took us downhill again, dropping us off at the foot of the Mt Bromo crater. We walked across the ashy desert-like landscape, joining the crowds of other visitors doing the same thing. We'd already been told stories about Mt Bromo by our tour leader, as its name comes from the Hindu fire and creator god, Brahma, and people would make offerings to the volcano, which was why there were lots of flower bouquets around, though livestock and other plants are also options. It originates from the legend of a princess and her husband who prayed to the gods for children, but had to sacrifice their last child to the volcano, and the child actually chose to sacrifice himself in the end, to save the area from the gods' anger, when his parents were reluctant to do so. We trekked across the flat land at the foot of the crater, then clambered up the rocks and stairs to the top, pausing to take photos of the beautifully eerie landscape around us in the early morning light. The crater itself was wide and deep, puffing out smoke, but it was impossible to see all the way in to the lava. You can walk around the edge of it too, but it's quite far, and the fumes were getting a little overwhelming, so we admired it for a few minutes before descending again. The jeeps took us back to the hotel, where we had breakfast - it was only 8am by this point! We didn't stay much longer though (it was very basic accommodation, only chosen for proximity to the volcano), before departing for the train station to continue on to Kalibaru. We would be going by train, while the driver followed with our luggage, as traffic could make his journey several hours longer than ours. The hotel in Kalibaru was very pretty when we arrived, as we stayed in bungalows again, set along a path flowing with flowers. 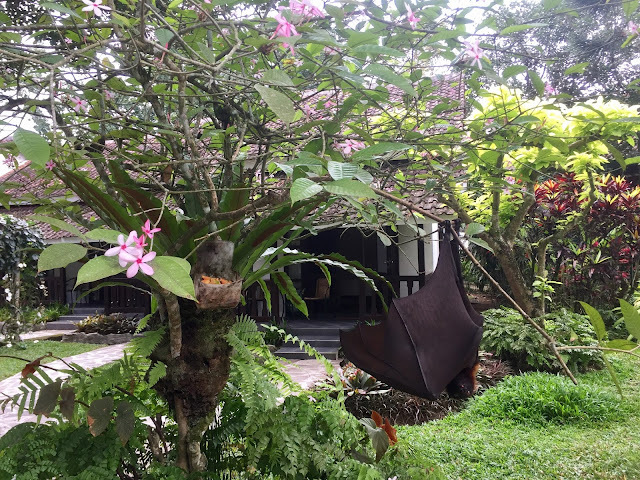 We even passed another fruit bat here, casually hanging from a tree on our way back to our room at one point! 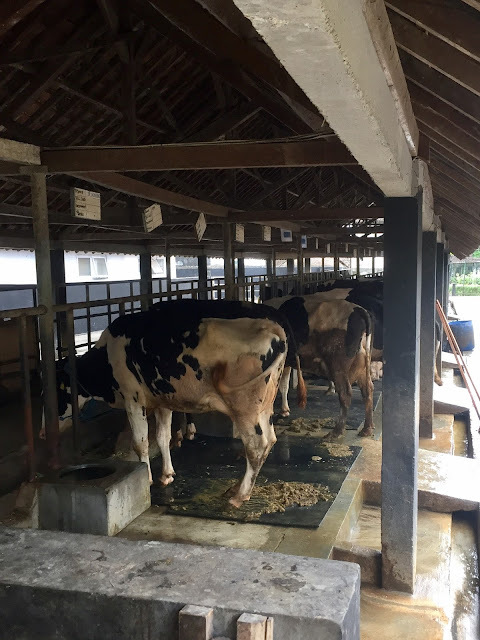 One of the most interesting parts of the hotel was the dairy next door that belongs to it, home to 20 or so cows, which produce fresh milk for the restaurant to use. However, as with our accommodation all three of the nights written about here, the wifi only existed in the lobby area and was painfully slow (part of the reason I fell so behind in blog posts!). Kalibaru was pretty small, and there didn't seem to be much to do in the town, but I think we were happy enough to have some time for relaxing after such an early start that morning. The following morning though, we embarked on a tour of the Glenmore plantation nearby (yes, a Scottish name!). It grows coffee, cocoa, and rubber trees, though it wasn't the season for cocoa beans while we were there. They showed us the plats though, and the buildings where they store and process everything - the boxes for cocoa were completely empty at that time. We were shown how the rubber is collected from the trees, and how they add water to it and press it into mats, which are then dried out in a sauna-like room. Even standing at the open door of that was stifling! They told us about the different types of coffee beans, including the 'poop' coffee, and we watched some women sorting through large baskets of beans, separating them based on quality. Finally, we got to try some of the coffee ourselves, accompanied by fried bananas (we seemed to have those quite often over these three days! ), and fresh bananas and dragonfruit grown there.